Review 147. Melissa Marr – Faery Tales & Nightmares. 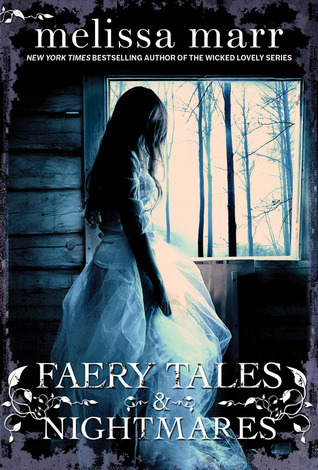 Title: Faery Tales & Nightmares. Published: February 21st 2012 by HarperCollins. Dangerous promises and beguiling threats swirl together in a dozen stories of enchantments dark and light by New York Times bestselling author Melissa Marr. Uncanny and unexpected creatures appear from behind bushes, rise from beneath the seas, or manifest from seasonal storms to pursue the objects of their attention—with amorous or sinister intent—relentlessly. From the gentle tones of a storyteller’s cadences to the terror of a blood sacrifice, tales of favorite characters from Marr’s Wicked Lovely novels mix with accounts of new characters for readers to fall in love with...or to fear. Lush, seductive, and chilling, Melissa Marr’s stories revel in the unseen magic that infuses the world as we know it. Table of Contents: "Where Nightmares Walk" "Winter's Kiss" "Transition" "Love Struck" "Old Habits" "Stopping Time" "The Art of Waiting" "Flesh for Comfort" "The Sleeping Girl and the Summer King" "Cotton Candy Skies" "Unexpected Family" "Merely Mortal"
Like you might now, I’m not such a fan of anthologies. I prefer long stories where I can bond with characters, so this book surprised me! Marissa did a great job in spinning stories with a fairytale feeling. Where nightmares walk was strange. It’s only 2 pages long and there is hardly anything to say about it. My expectations dropped down, but I’m happy to say that Winter’s kiss made me excited again. It’s a fairytale about a girl whose breathe freezes everything around her. She can’t find her place in this world, until she is visited by an ice bear. This meeting is about to change her life. This was one of my favorite stories. Transition is a vampire story and it was a bit strange. It gave me a “meh” feeling. Love struck was great on the other hand. It’s about a Selkie boy called Murrin who is trying to win the love of his true match Alana. Old habits, Cotton Candy Skies, Stopping time and Unexpected family were hard to follow. These stories belong to the Wicked Lovely series and I couldn’t understand it. I will return to this anthology after reading the series. The art of waiting was interesting, you have to see it for yourself. Flesh for comfort was bizarre, in a good way! It gave me the creeps. The sleeping girl and the Summer king was my other favorite story. It’s about a girl who gets to choose; living forever with the Summer King or ruling the Winter. Fairytale feeling! Merely Mortal was sweet, about the love between the Winter queen and a fairy who became mortal after saving her life. This book was definitely enjoyable and I think I’m going to take a look at her series. Her writing-style was pleasant enough. I read one of her books, Graveminder. Which was okay ;) I haven't read her Faery series, which I heard some enthusiastic things about! For some reason, anthologies don't really do it for me... but this one sounds very sweet. For me neither, but I'm still trying to find a good one :p and I always like to see if the authors writing-style work for me. Sounds like this anthology, like most, is a mixed bag. Glad there were some good stories included and that you got a taste for Marr's writing. The cover is quite pretty indeed. I'm not very big on short stories either, there just isn't enough to connect to let alone write a review about. One that is only 2 pages? Holy crow! It's too bad some of them were a bit hard to follow without having read the Wicked Lovely series. Great review, Mel, thanks for sharing! I love the cover..interested in the stories..might need to check this one out! I don't do many anthologies, but does seem a nice way to get a taste of author's style. I'm not a fa of anthologies either and in fact, if I don't have a very good reason to pick them up, I just end up skipping them entirely. I'll probably do just that with this one too, but there is a story or two that sounds appealing, like The Sleeping Girl and the Summer King. I think you will like this one if you liked her Wicked Lovely book! I dind't know these were part of the Wicked Lovely world. I did read book 1 and 2 of Wicked Lovely and while I liked the first, the sequel was a DNF for me it was so much different. They're more like companions too I think. Anyways, too bad this wasn't better but maybe you'd get it more if you read the series. Oh, I've read mixed reviews about this series, but I'll see. So far, I'm too busy reading other books. I haven't read anything by Melissa Marr. I do have Wicked Lovely from the library right now, but I just don't know if I will get to it. 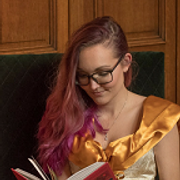 I really enjoyed the Wicked Lovely series, and I had always meant to pick this up to get more of that world; it's nice to hear that you enjoyed it, despite not having read those books! You'll like this one then! I read this earlier last year but I agree with you. I love how we meet characters from Wicked Lovely series and I'm glad that you enjoyed the book! I like short story collections every once and a while, like The Curiosities with Brenna Yovanoff, Tessa Gratton & Maggie Stiefvater. I didn't know Melissa Marr wrote an anthologies though. It sounds interesting. I'll have to put it on my TBR list. I have The curiosities on my list! That's a good thing to hear! I haven't read very many anthologies before and heard of this a few months after I first started blogging, I think when it was just coming out- I have been on and off intrigued by it and then decided I wouldn't read it because it would probably make me uncomfortable, I thought it was more horror centric, but this sounds really good! I'm certainly going to try it out! Awesome review, Mel, I'm only sorry you didn't like it more. Ehh - I haven't read any of her books. I love anthologies but hmm wouldn't pick this up unless I finally decide to read Wicked Lovely.